Adult stem cells can survive a wide variety of insults from ionizing radiation to toxic chemicals. 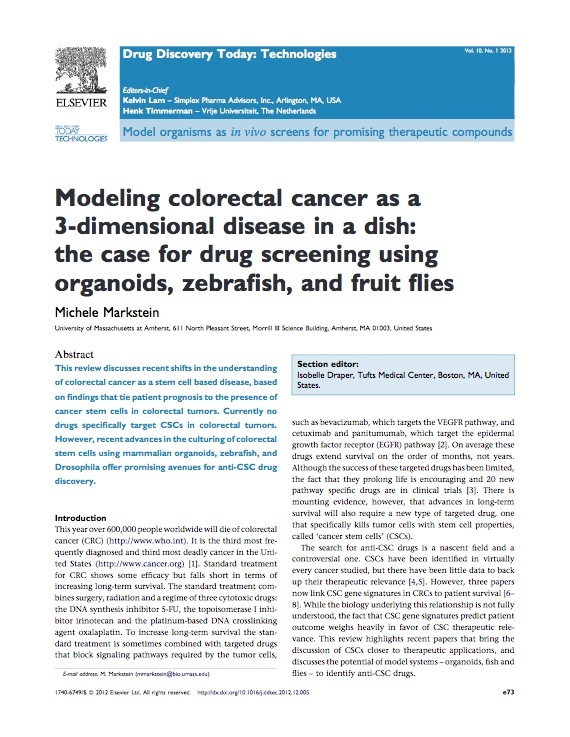 To date, the multidrug resistant features of stem cells have been characterized only in vertebrates, where there is a critical need to understand how cancer stem cells thwart chemotherapy drugs. 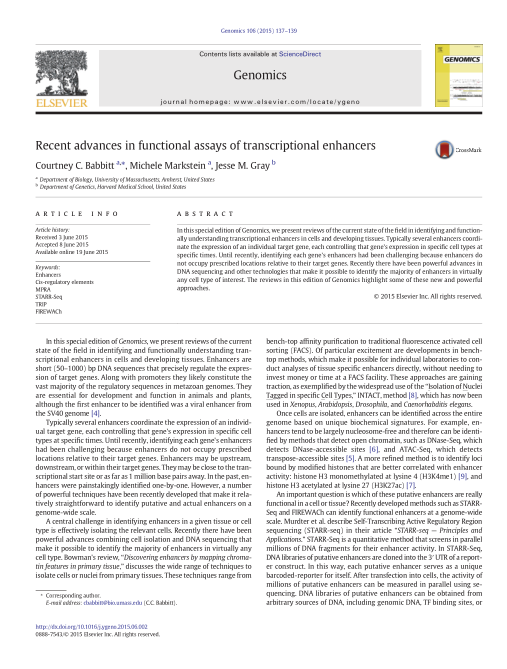 These studies reveal that the ability of both normal and cancer stem cells to survive toxins hinges on their high levels of expression of ABC transporters, transmembrane pumps that efflux lipophilic compounds out of cells. 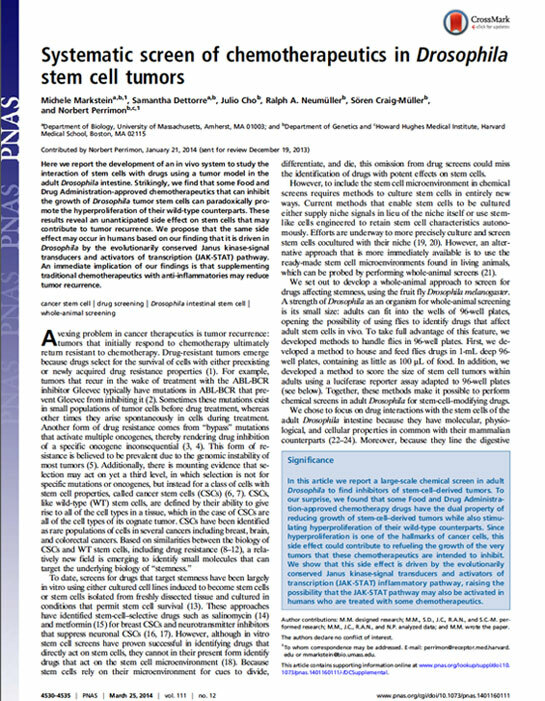 This has been observed across a wide spectrum of vertebrate stem cells including breast, blood, intestine, liver, and skin, suggesting that high efflux ability and multidrug resistance may be general features of stem cells that distinguish them from their differentiated daughter cells. 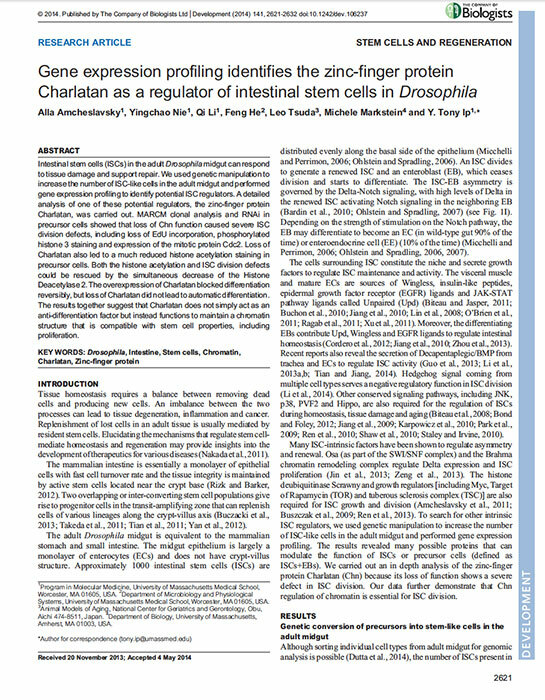 Here we show that these previously described vertebrate stem cell features are conserved in Drosophila intestinal stem cells. Using a novel in vivo efflux assay and multiple drug challenges, we show that stem cells in the fly intestine depend on two ABC transporters–one constitutively expressed and the other induced–for efflux and multidrug resistance. 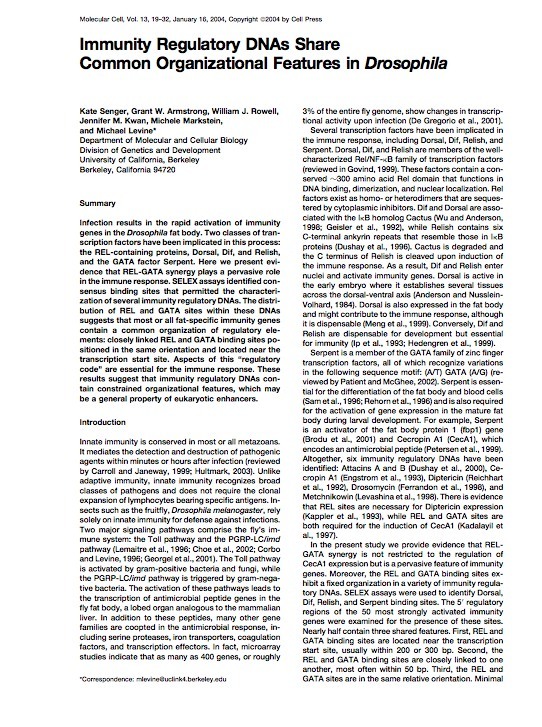 These results suggest that stem cell multidrug resistance by ABC transporters is a general stem cell feature conserved over 500 million years of evolution. 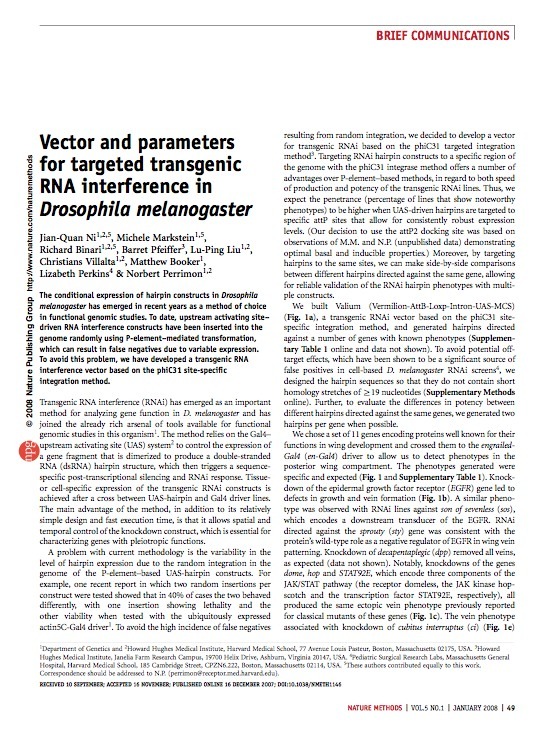 Over 50 years ago, Susumo Ohno proposed that dosage compensation in mammals would require upregulation of gene expression on the single active X chromosome, a mechanism which to date is best understood in the fruit fly Drosophila melanogaster. 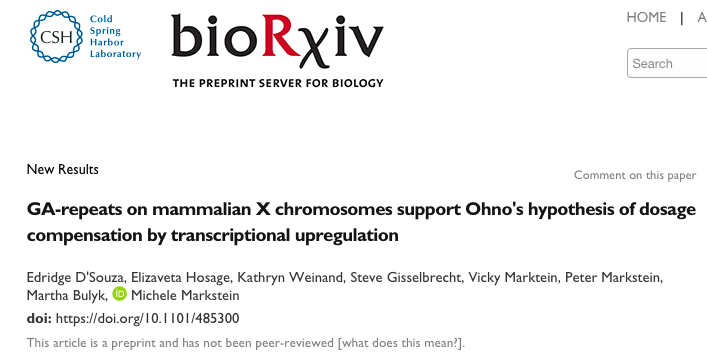 Here, we report that the GA-repeat sequences that recruit the conserved MSL dosage compensation complex to the Drosophila X chromosome are also enriched across mammalian X chromosomes, providing genomic support for the Ohno hypothesis. 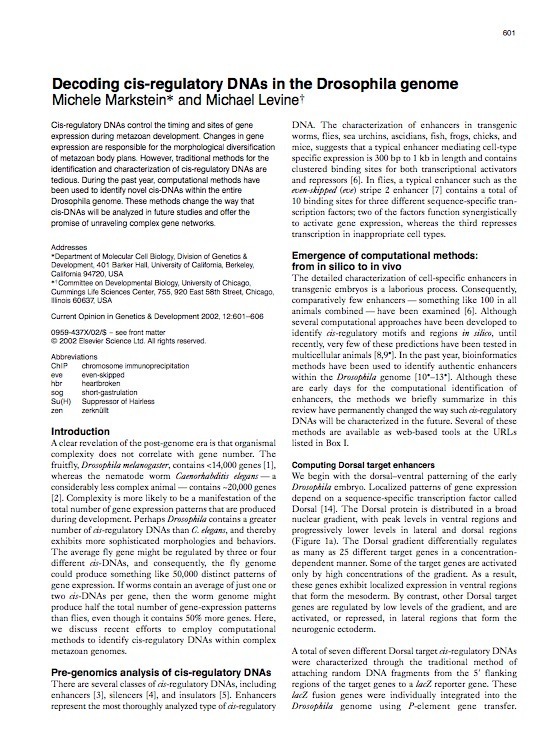 We show that mammalian GA-repeats derive in part from transposable elements, suggesting a mechanism whereby unrelated X chromosomes from dipterans to mammals accumulate binding sites for the MSL dosage compensation complex through convergent evolution, driven by their propensity to accumulate transposable elements. The differentiation of naive CD8 T cells into effector cytotoxic T lymphocytes upon antigen stimulation is necessary for successful antiviral, and antitumor immune responses. 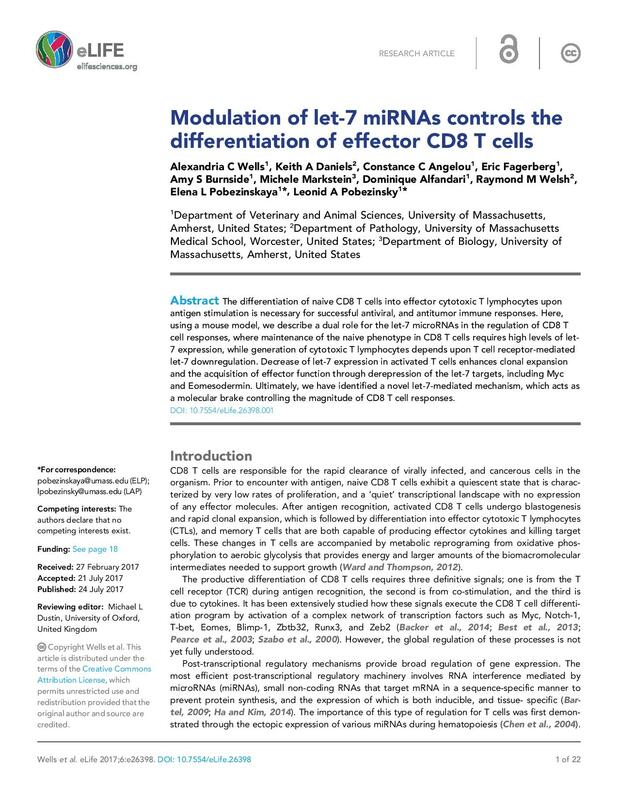 Here, using a mouse model, we describe a dual role for the let-7 microRNAs in the regulation of CD8 T cell responses, where maintenance of the naive phenotype in CD8 T cells requires high levels of let-7 expression, while generation of cytotoxic T lymphocytes depends upon T cell receptor-mediated let-7 downregulation. Decrease of let-7 expression in activated T cells enhances clonal expansion and the acquisition of effector function through derepression of the let-7 targets, including Myc and Eomesodermin. Ultimately, we have identified a novel let-7-mediated mechanism, which acts as a molecular brake controlling the magnitude of CD8 T cell responses. 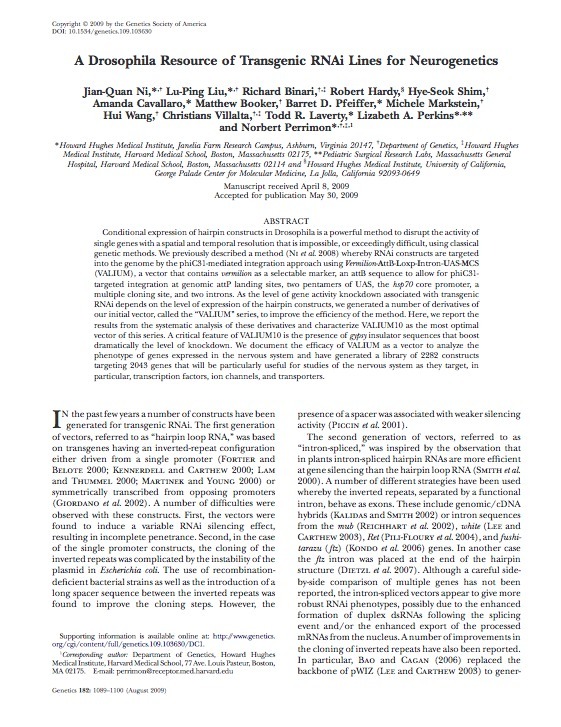 Babbitt C., Markstein M., Gray J. 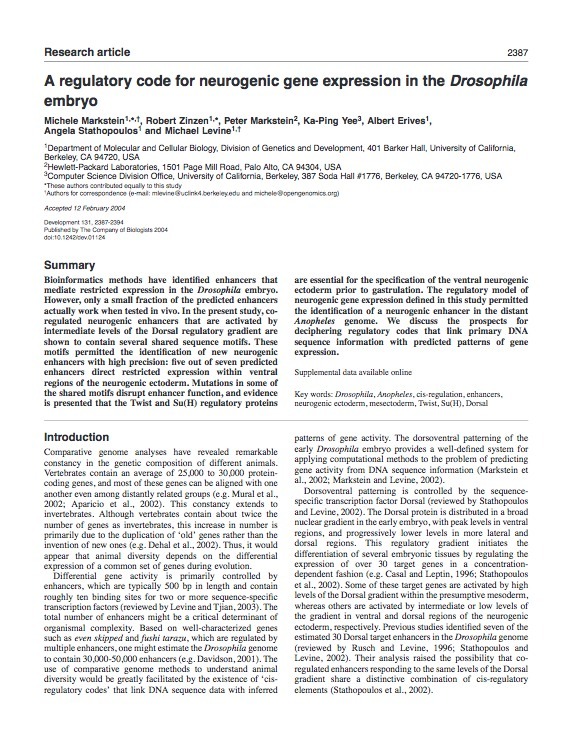 In this special edition of Genomics,we present reviews of the current state of the field in identifying and functionally understanding transcriptional enhancers in cells and developing tissues. 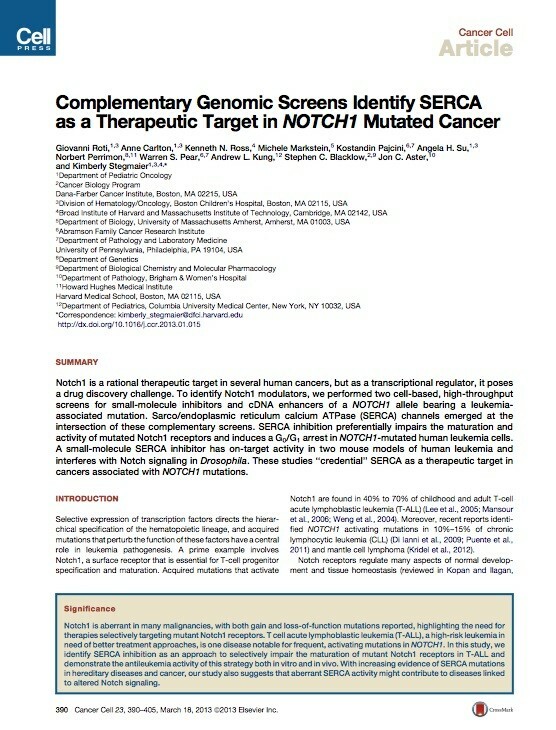 Typically several enhancers coordinate the expression of an individual target gene, each controlling that gene’s expression in specific cell types at specific times. 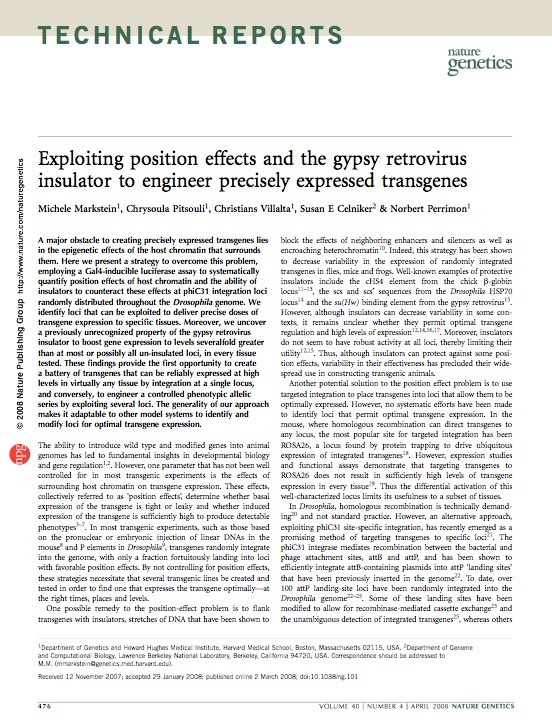 Until recently, identifying each gene’s enhancers had been challenging because enhancers do not occupy prescribed locations relative to their target genes. Recently there have been powerful advances in DNA sequencing and other technologies that make it possible to identify the majority of enhancers in virtually any cell type of interest. 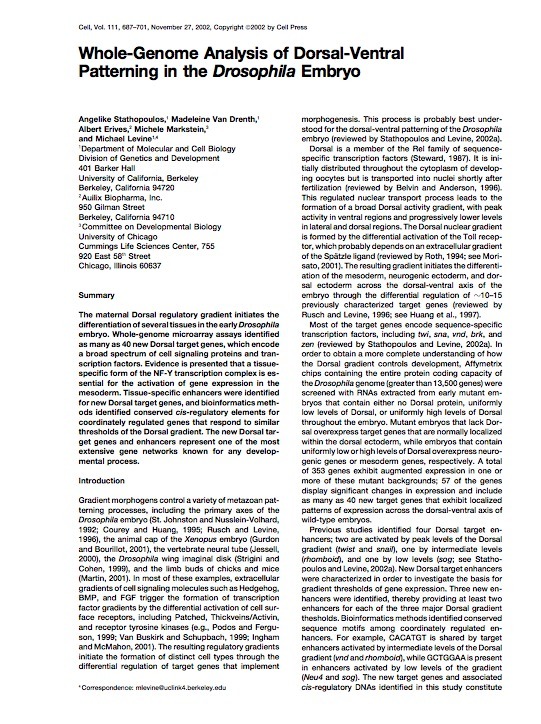 The reviews in this edition of Genomics highlight some of these new and powerful approaches. Amcheslavsky A., Nie Y., Li Q., He F., Tsuda L., Markstein M., Ip YT. Markstein M*, Dettorre S, Cho J, Neumüller RA, Craig-Müller S, Perrimon N*. Roti G, Carlton A, Ross KN, Markstein M, Pajcini K, Su AH, Perrimon N, Pear WS, Kung AL, Blacklow SC, Aster JC, Stegmaier K.
Ni JQ, Liu LP, Binari R, Hardy R, Shim HS, Cavallaro A, Booker M, Pfeiffer BD, Markstein M, Wang H, Villalta C, Laverty TR, Perkins LA, Perrimon N.
Exploiting position effects and the gypsy retrovirus insulator to engineer precisely expressed transgenes. Markstein M*, Pitsouli C, Villalta C, Celniker SE, Perrimon N.
Markstein M*, Zinzen R, Markstein P, Yee KP, Erives A, Stathopoulos A, Levine M*. Senger K, Armstrong GW, Rowell WJ, Kwan JM, Markstein M, Levine M.
Stathopoulos A, Van Drenth M, Erives A, Markstein M, Levine M.
Markstein M, Markstein P, Markstein V, Levine MS.